The very first time I tasted a persimmon I was not impressed. It had a gelatinous texture that I really did not find appetizing – my apologies to everyone who likes Hichiya persimmons. So it took some convincing, on the part of a friend at the farmers market, to get me to taste the Fuyu variety. ‘Come on’ she cajoled, ‘you’ll love it’. I really was not convinced but she was absolutely right. I bought masses of them. I love their crunchy, sweet texture and found them to be hugely versatile. They are marvelous in salads, and bring an extra dimension of color to the dish. They grill and roast well which gives the fruit an added depth in flavor and of course you can just munch on one too. 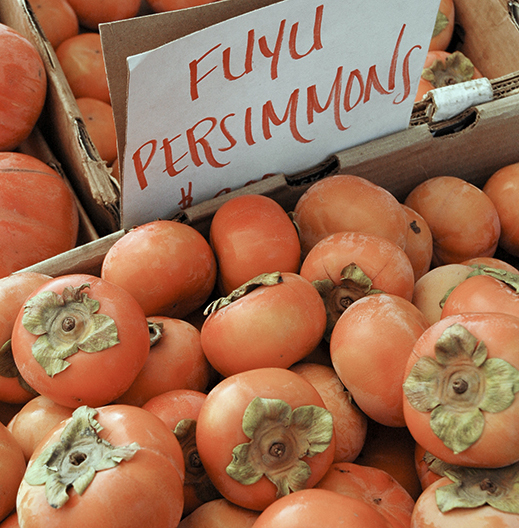 They are abundant now at the local markets – just be sure to ask for the Fuyu variety! Pour a little olive oil into a large bowl. Add in all the persimmon slices and toss to coat well. Pour the lemon olive oil and the fig balsamic vinegar into a salad bowl and whisk together. Add a good pinch of salt and some black pepper and whisk again. Place serving utensils on top of the vinaigrette. Place all the remaining ingredients on top of the utensils. Place a large skillet or cast iron ridged pan over medium high heat. When the pan is hot, add the persimmon slices and cook for 1-2 minutes on each side. Once they are cooked (you may have to do this in batches) add them to the salad bowl. Toss and serve whilst the persimmons are still warm.